MSI's Gaming series of products spans motherboards, graphics cards, notebooks and all-in-ones and has become well established in the marketplace for its focus on enthusiasts and gamers. 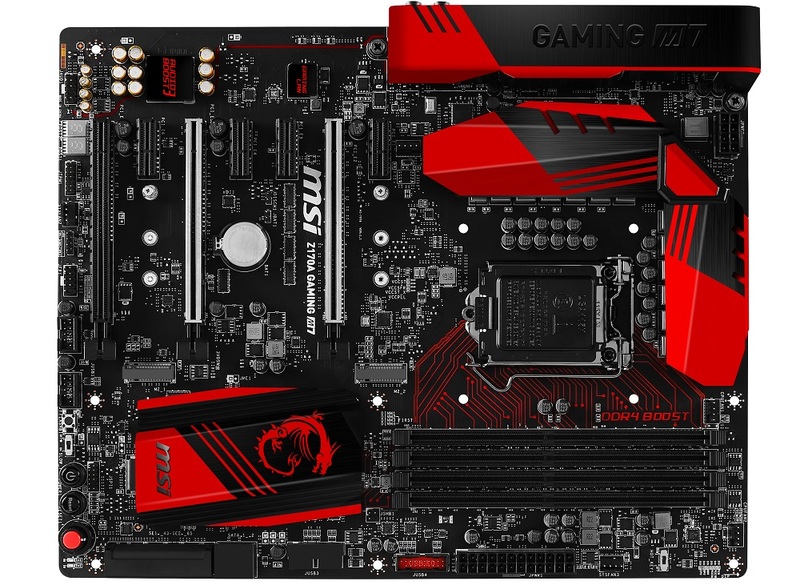 With the launch of Intel's new Z170 Express motherboard chipset MSI's focus on gaming hasn't wavered but has diversified in the way it targets gamers by introducing a new segmentation strategy for its portfolio of PC gaming motherboards. Sitting alongside the flagship Enthusiast Gaming line is the Performance Gaming and the Arsenal Gaming segments. These products align in a good (Arsenal), better (Performance), best (Enthusiast) fashion meaning they are to be spec'd and priced appropriately. In for testing at the HEXUS labs is the MSI Z170A Gaming M7, a motherboard that slots into the Enthusiast Gaming (best) category. 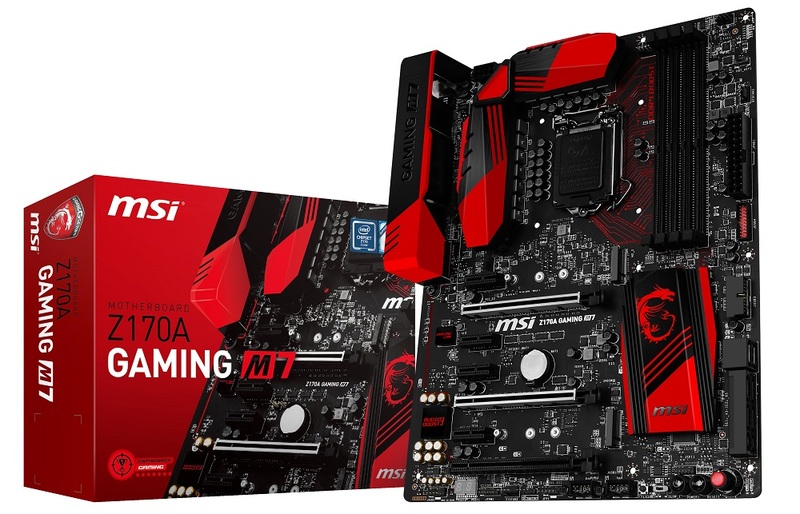 The M7 isn't quite the flagship MSI Z170 motherboard, both the Z170A XPower Gaming Titanium and Z170A Gaming M9 ACK are rated higher, but for all intents and purposes the M7 is a premium motherboard targeting high-end PC gamers. As a gaming motherboard the M7 touts the latest Qualcomm Killer gigabit networking chip, the Killer E2400, with 15kV of surge protection and traffic prioritisation with the Killer network manager. Gaming audio is handled by the Audio Boost 3 package that includes a blend of beefed up audio components and tweaks such as an isolated PCB, EMI shielding for the codec, dual operational amplifiers, Nippon Chemi-Con (Japanese) capacitors and MSI's newest audio enhancement software packaged dubbed Nahimic. 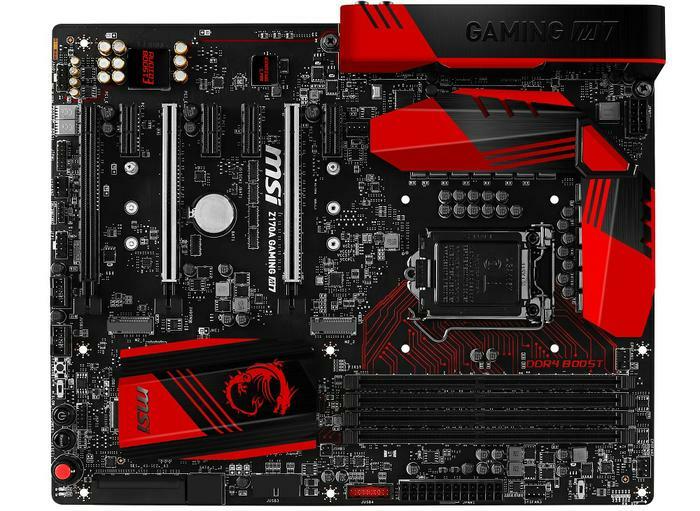 Storage is a big focus on the MSI Z170A Gaming M7 motherboard. USB 3.1 Type-A and Type-C are both present through ASMedia controllers as well as SATA Express and dual M.2 ports featuring Gen3 bandwidth of 32Gb/s per port compared to the 10Gb/s of previous-gen motherboards. A U.2 adapter is sold separately for Intel 750 Series SSD owners, too. The MSI Z170A Gaming M7 bags a couple of hardware extras that the lower M5, G45 and M3 models do not possess in the form of the Gaming Hotkey and Game Boost switch. For readers who have followed MSI motherboards of previous generations the Game Boost switch is the OC Genie button rebranded in-line with the new gaming focus. Depending on the switch position the motherboard will apply an automatic overclock ranging from 4.3GHz to 5GHz, though success will vary depending on silicon quality and cooling. Gaming Hotkey is MSI's attempt at a rival solution to the ASUS KeyBot technology we saw last year with ROG Z97. In a nutshell this entails piece of dedicated silicon that allows the keyboard to have specific keys reprogrammed to macro functions that can interact with the CPU and BIOS, such as turning the PC on or entering the BIOS. MSI's styling is typical of the Gaming Series with a red and black theme that sports the iconic dragon on the PCH heatsink. An I/O cover has also been implemented for added visual delight while red highlighting to the DDR4 tracers is another striking addition. MSI equips the two primary PCIe lanes, where most users will install their GPUs, with a reinforcing metal guard to prevent damage from heavy graphics cards. Another finer detail not immediately obvious from looking at the board is that MSI has raised the M.2 ports slightly higher, 7.05mm versus 2.92mm, to enable thicker M.2 drives with heatsinks to be installed if they become available in the future. The rear I/O is a little sparse given the competition, MSI provides 7 USB ports on the rear - three USB 2.0, two USB 3.1 and two USB 3.0. The vertically mounted USB 2.0 port acts as the USB Flashback port which allows users to upgrade their BIOS using a motherboard and power supply only, a CPU or RAM need not be installed.